They say that “breakfast is the most important meal of the day”, and in my life that is so true. After a good eight hours sleep (partner’s snoring permitting), it is important to refuel and re-energise yourself by starting your day with sufficient energy and protein to help reduce fatigue and keep concentration at the highest levels possible - essential in my line of work where I deal with lots of data. Ok, there are conflicting reports on the impact on your body of not having anything for breakfast vs eating something later on in the day, but one fact of life is that we all need to eat. So it makes sense to me that if I’ve not eaten anything for the previous eight hours whilst asleep, having breakfast at the start of the day is the best time for me to ensure I get the fuel and nutrition that my body needs. As a calorie counter myself I tend to watch what I eat. This means I can’t be eating a hearty full English breakfast every day (at an average of 800-1,000 calories per plate) when the recommended calories per day for women is around 2,000. Instead, I prefer to focus on burning more than I eat which might include a quick pit stop at the gym at 7am. I therefore look to eat smaller, healthy portions which are high in carbohydrates and protein that are generally good for my body. Carbs give your body energy and allows the brain the fuel it needs to take on the day’s tasks. Protein is an important building block of the bones, muscles, skin, cartilage and blood and repairs and builds tissues as well as giving you the staying power and fuel needed to survive (until your next meal at least). Wholegrain cereals or bread are great sources of carbohydrates and are another area where supermarket own brands offer better value for money than the equivalent national brands. Of course, both have the same benefits with your granary toast coming in at under 100 calories with butter or a bowl of cereal with milk around 300 calories. Both are relatively light meals and include the nutrients you need to start the day off well. Have a look at the table below produced by Statista. The grey bar shows number of users for breakfast cereal brands in 2015, the black bar is data for 2016 and the blue bar is 2017. You can see Kellogg’s is dominating the market but this has decreased in those three years. 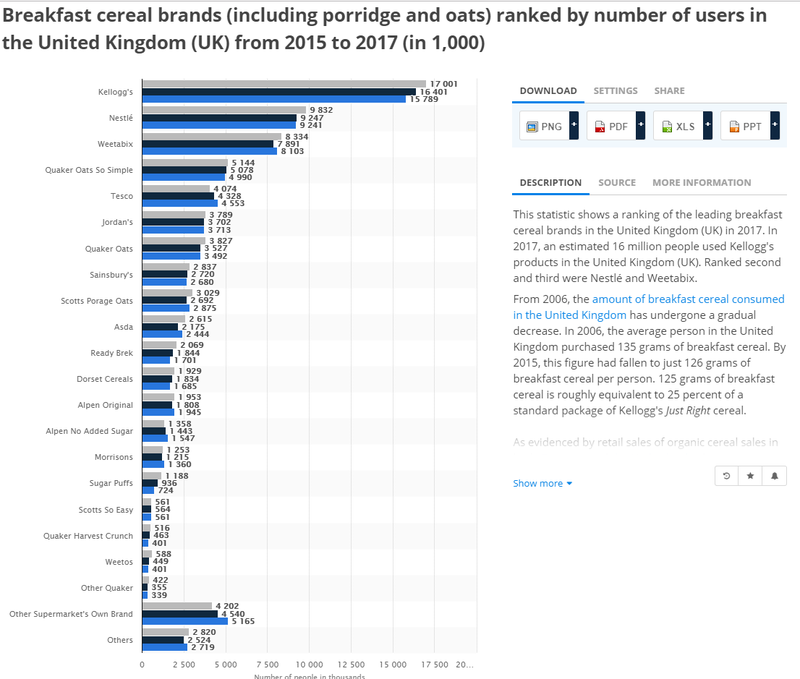 Other leading brands such as Weetabix and Nestle also perform well but the likes of Tesco, Sainsbury and Asda hold their own against well-known products such as Alpen, Sugar Puffs and Ready Brek. What also stood out to me is the ‘Other Supermarket’s Own Brand’ row second from the bottom. There is growth here and combined in this way, outperforms some big names such as Jordan’s and is competing with Quaker Oats! What are own brands doing to be so competitive in this space? New products are appearing in the breakfast-to-go category all the time as it seems that people have even less time to sit down at home for breakfast. 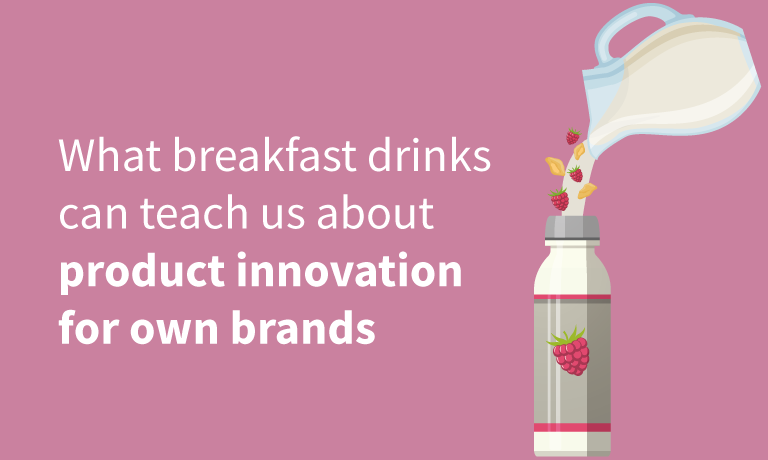 Gulping down breakfast in a liquid form is a relatively new trend in the UK. Tesco and Asda have a range of breakfast drinks, including high protein versions, which are often lower in price than the market leaders Weetabix On The Go and Fuel. It appears that Sainsbury’s, Morrisons and Aldi are lagging behind on breakfast drink innovation and therefore missing out on a lucrative part of the breakfast market. For own brand retailers to continue to compete with national brands in the breakfast category, they need to collaborate with their suppliers to come up with new product ideas and ways of serving changing lifestyles. The supermarkets that haven’t got an own brand liquid breakfast to offer have perhaps missed out on getting a jump on the national brands but they could certainly consider upgrading their breakfast category with their own version of a breakfast drink. A major challenge to product innovation is the vast amount of information that's required to effectively develop products and to monitor performance after launch. 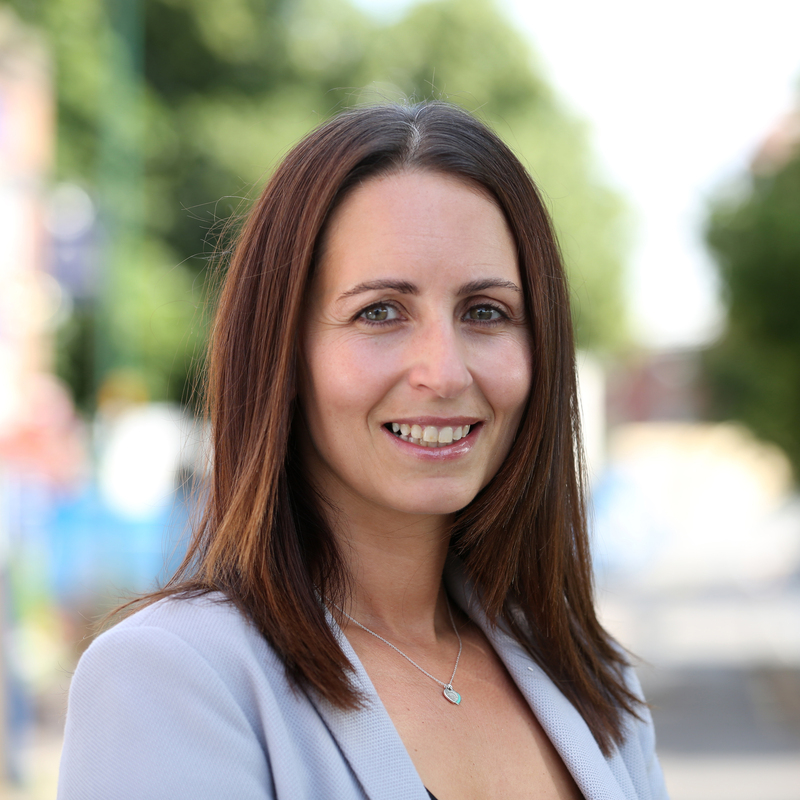 Product benchmarking tests, sales figures and complaints are all valuable indicators, as are the less obvious ones, such as online reviews, depot quality checks and sensory and insight panels. There are so many available sources of data and without the time to filter through all of them, it's a really difficult and time-consuming job to pull everything together. That’s where my job at S4RB comes in, helping retailers to pull data together into One View of product performance, allowing retail teams to look at the performance of a whole range, or category. At home, I’m looking to mix it up with great and healthy sources of energy for breakfast including yogurts and nuts for protein and fruit and veg for essential vitamins (and are again great for carbs). At work, I’m excited about what the forward-thinking retailers can do for me as a customer by collaborating with their talented supply base to come up with the new product ideas, and what they can do by working across a shared view of product data to deliver healthy, tasty options that customers keep coming back for.